The Board of Directors of Muskoka Pride is a dedicated group of individuals from across Muskoka who volunteer their time to bring visibility and build acceptance and celebration of the LGBTQ+ community of Muskoka. Elections are held every year at the Annual General Meeting held in the fall. Directors are elected to a 2-year term, and Executive positions are elected by the Board for a 1-year term. I have been a Registered Practical Nurse since 1974, and worked in nursing in Bracebridge 12 years and in Ottawa for 30 years. I hold an honors BA in sociology from Carleton University, with a queer history and rights focus. I have worked with the College of Nurses of Ontario. I was active with CUPE in human and gay rights. During my last 8 years in nursing, I was an educator and team leader. I revised and delivered the orientation program to all new staff. I was involved in the revision of the provincial resident assessment program, tools and guidelines, and known to be a positive and effective mentor for other homes in eastern Ontario. Since I am retired now, I will have plenty of time to invest in Muskoka Pride and its Board. I can and will be available to support and assist other members of the Board as requested, and investigate the issues affecting our community. I have been a member of Muskoka Pride since 2011. I direct most of my capabilities to social activities, especially our Festive Week. As your Treasurer I take my responsibility seriously to ensure that our financial budgets are kept in line. It is my honour to be a member of the Board, to work for the betterment of our community. Shawn is a grade 2 teacher in Bracebridge. He is involved in several community organizations, including: Scouts Canada, the Elementary Teacher's Federation of Ontario, and Tourette Canada. Shawn is a member of the Trillium Lakelands DSB Positive Space committee. 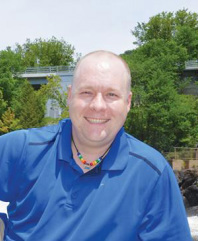 Shawn has been involved with Muskoka Pride since the first picnic back in 2009 and he hopes to help develop a sense of LGBTQ+ community within Muskoka. Lane is a nonbinary activist from Bracebridge. They helped found the group Nonbinary Toronto, and they have participated in many queer liberation, climate justice, anti-racist, and harm reduction initiatives in Toronto over the past five years. Since moving back to their home town they have been working to build the new group Trans & Gender-Variant Muskoka to create community supports for gender-diverse people in the region. As youth director they look forward to providing peer support and building leadership skills with Muskoka's LGBTQ+ young people. I have been living my life "out" for as long as I knew what being out was all about. I've always advocated for LGBTQ+ rights, from tackling letters to the editor as a teen and historical projects in college, to using most opportunities as they present themselves in daily life and work to confront or respond to issues arising in work or social life. I am married and a mother. My hope is to continue to expand the work Muskoka Pride has been doing to envelope more people in our community, including our allies, to ensure we are always moving forward and to continue to ensure our children have positive space throughout their lives. I became a member of Muskoka Pride shortly after relocating to Bracebridge in 2014. As a member, I enjoyed attending and participating in several of the scheduled events that were offered throughout the year. I also actively volunteered for the organization, being reliable and dependable. I not only volunteered my time, but offered the skills and expertise I have, with my design background. I was thrilled to be recommended and accepted to be part of the Board in 2016, and then again in 2018. With having the experience of one term under my belt, I am confident to focus my efforts on areas within the organization that I feel would benefit from having a Board member dedicate their time and efforts to advance them from where they were a year ago. Natalie relocated to Muskoka in 2008 due to career placement. Natalie has a Bachelor of Applied Human Services - Police Studies Degree and works in Muskoka. Natalie is dedicated to ensuring inclusivity and diversity in both her work and play. This is Natalie’s first year on the board and she is looking forward to making positive changes with a focus on being inclusive. This is Jim's first year on our Board.